A surprising feature of bovine rhodopsin is the highly structured extracellular N terminus and extracellular loops . In particular, the second extracellular loop (E2), which connects TM4 and TM5, dives down into the transmembrane domain and forms a "plug" that contacts retinal (Table 1 and Fig. 2). This loop also contains a highly conserved Cys that is disulfide-bonded to another highly conserved Cys at the top of TM3 . E2 contains two stretches of P-strand, one of which, P4, lies directly over retinal . E2 thus forms a lid over retinal and protects it from the extracellular milieu. Given the high degree of conservation of the amino acids in the P4 strand in vertebrate opsins, and the variability within this region in other class A receptors, the prevailing view was that the P4 strand might serve specifically to define the retinal-binding pocket in vertebrate opsins and not other GPCRs [12,13]. We suggest that this response is at least partly wrong, for a number of reasons discussed below. Figure 3 Ligand binding crevice. In (A), the residues in the TMs that were identified from the SASA analysis (see text, Table 1, and Fig. 2) are shown in van der Waals representation, with retinal bound within the surface created by these residues. In (B), the side chains of residues from the P2-adrenergic receptor are shown on the backbone of the rhodopsin structure. These residues have been experimentally determined to interact with catecholamine ligands, and include Asp113332, Ser203542, Ser204543, Ser207546, Phe208547, Trp286648, Phe289651, Phe290652, and Asn293655, a subset of the positions shown in (A). In (C), IpBABC (p- (bromoacetamido) benzyl-1-[125I]iodocarazolol), an affinity label derivative of pindodol, is docked within the TMs of the rhodopsin structure with the TM residues from Table 1 mutated to the aligned P2-adrenergic receptor residues. IpBABC is shown covalently attached to His932 64 in TM2. Residues with the same index number are shown in the same color in all three panels. The residues displayed next to each other are shown in different colors. (From Ballesteros, J. et al., Mol. Pharmacol. 60, 1-19, 2001. With permission.) A color representation of this figure is available on the CD version of the Handbook of Cell Signaling. is possible that an orientation of E2 similar to that in rhodopsin may explain these findings. Several reports implicate E2 in ligand specificity in a number of small molecule-ligand GPCRs. Perez and colleagues found that substitution of three consecutive residues in E2 changed the ligand specificity for particular antagonists from that of a1BAR to that of a1AAR, and vice versa . Similarly, substitution of E2 and TM5 altered the subtype specificity of the 5-HT1D receptor to that of the 5-HT1B receptor and vice versa , and substitution of a single residue in E2 was also sufficient to interconvert the pharmacological specificity of canine 5-HT1D and human 5-HT1D receptor . In adenosine receptor, in which the binding site is also formed in the transmembrane domain , several glutamate residues in E2 are critical for ligand recognition [20,21]. 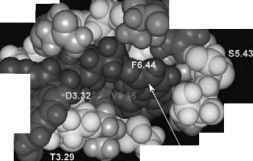 Although it is currently difficult to envision the entrance route of ligands into the binding-site crevice and the potential associated conformational rearrangements of E2, these data nonetheless suggest a direct role of residues in E2 in ligand binding in other class A receptors . We are grateful to all our current and former colleagues and collaborators, and especially to Myles Akabas, Juan Ballesteros, Arthur Karlin, and Harel Weinstein for much helpful discussion, and to NIMH grants 57324 and 54137, the Lebovitz Foundation, and the Lieber Center for support. 1. Gether, U. (2000). Uncovering molecular mechanisms involved in activation of G protein-coupled receptors. Endocr. Rev. 21, 90-113. 2. Terstappen, G. C. and Reggiani, A. (2001). In silico research in drug discovery. Trends Pharmacol. Sci. 22, 23-26. 3. Palczewski, K., Kumasaka, T., Hori, T., Behnke, C. A., Motoshima, H. et al. (2000). Crystal structure of rhodopsin: a G protein-coupled receptor. Science 289, 739-745. 4. Ballesteros, J. A., Shi, L., and Javitch, J. A. (2001). Structural mimicry in G protein-coupled receptors: implications of the high-resolution structure of rhodopsin for structure-function analysis of rhodopsin-like receptors. Mol. Pharmacol. 60, 1-19. 5. Schwartz, T. W. and Rosenkilde, M. M. (1996). Is there a "lock" for all agonist "keys" in 7TM receptors? Trends Pharmacol. Sci. 17, 213-216. 6. Ballesteros, J. and Weinstein, H. (1995). Integrated methods for the construction of three-dimensional models of structure-function relations in G protein-coupled receptors. Meth. Neurosci. 25, 366-428. 7. DeMartino, J. A., Van Riper, G., Siciliano, S. J., Molineaux, C. J., Konteatis, Z. D. et al. (1994). The amino terminus of the human C5a receptor is required for high affinity C5a binding and for receptor activation by C5a but not C5a analogs. J. Biol. Chem. 269, 14446-14450. 8. Gerber, B. O., Meng, E. C., Dotsch, V., Baranski, T. J., and Bourne, H. R. (2001). An activation switch in the ligand binding pocket of the C5a receptor. J. Biol. Chem. 276, 3394-3400. 9. Macdonald, D., Murgolo, N., Zhang, R., Durkin, J. P., Yao, X. et al. (2000). Molecular characterization of the melanin-concentrating hormone/receptor complex: identification of critical residues involved in binding and activation. Mol. Pharmacol. 58, 217-225. 10. Shapiro, D. A., Kristiansen, K., Kroeze, W. K., and Roth, B. L. (2000). Differential modes of agonist binding to 5-hydroxytryptamine(2A) serotonin receptors revealed by mutation and molecular modeling of conserved residues in transmembrane region 5. Mol. Pharmacol. 58, 877-886. 11. Savarese, T. M., Wang, C. D., and Fraser, C. M. (1992). Site-directed mutagenesis of the rat m1 muscarinic acetylcholine receptor. Role of conserved cysteines in receptor function. J. Biol. Chem. 267, 11439-11448. 12. Menon, S. T., Han, M., and Sakmar, T. P. (2001). Rhodopsin: structural basis of molecular physiology. Physiol. Rev. 81, 1659-88. 13. Bourne, H. R. and Meng, E. C. (2000). Structure. Rhodopsin sees the light. Science 289, 733-734. 14. Javitch, J. A., Shi, L., Simpson, M. M., Chen, J., Chiappa, V. et al. (2000). The fourth transmembrane segment of the dopamine D2 receptor: accessibility in the binding-site crevice and position in the transmembrane bundle. Biochemistry 39, 12190-12199. 15. Matsui, H., Lefkowitz, R. J., Caron, M. G., and Regan, J. W. (1989). Localization of the fourth membrane spanning domain as a ligand binding site in the human platelet alpha 2-adrenergic receptor. Biochemistry 28, 4125-4130. 16. Zhao, M. M., Hwa, J., and Perez, D. M. (1996). Identification of critical extracellular loop residues involved in alpha 1-adrenergic receptor subtype-selective antagonist binding. Mol. Pharmacol. 50, 1118-1126. 17. Wurch, T., Colpaert, F. C., and Pauwels, P. J. (1998). Chimeric receptor analysis of the ketanserin binding site in the human 5-hydroxytryptamine1D receptor: importance of the second extracellular loop and fifth transmembrane domain in antagonist binding. Mol. Pharmacol. 54, 1088-1096. 18. Wurch, T. and Pauwels, P. J. (2000). Coupling of canine serotonin 5-HT(1B) and 5-HT(1D) receptor subtypes to the formation of inositol phosphates by dual interactions with endogenous G(i/o) and recombinant G(alpha15) proteins. J. Neurochem. 75, 1180-1189. 19. Ji, T. H., Grossmann, M., and Ji, I. (1998). G protein-coupled receptors. 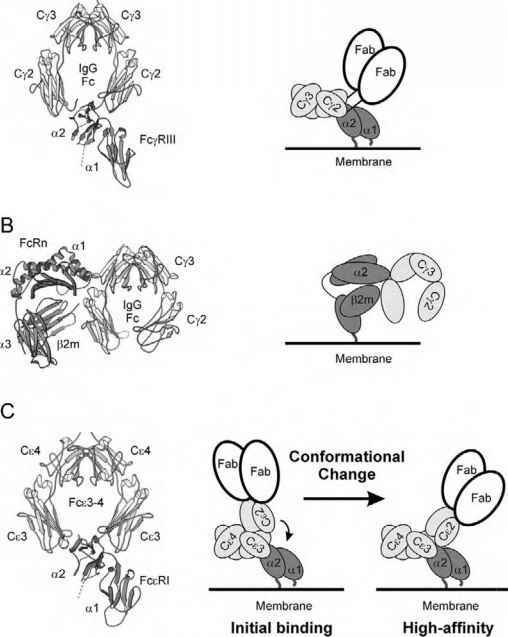 I. Diversity of receptor-ligand interactions. J. Biol. Chem. 273, 17299-17302. 20. Olah, M. E., Jacobson, K. A., and Stiles, G. L. (1994). Role of the second extracellular loop of adenosine receptors in agonist and antagonist binding. Analysis of chimeric A1/A3 adenosine receptors. J. Biol. Chem. 269, 24692-24698. 21. Kim, J., Jiang, Q., Glashofer, M., Yehle, S., Wess, J., and Jacobson, K. A. (1996). Glutamate residues in the second extracellular loop of the human A2a adenosine receptor are required for ligand recognition. Mol. Pharmacol. 49, 683-691. 22. Shi, L. and Javitch, J. A. (2002). The binding site of aminergic G protein-coupled receptors: the transmembrane segments and second extracellular loop. Annu. Rev. Pharmacol. Toxicol. 42, 437-467. 23. Javitch, J. A., Fu, D., Chen, J., and Karlin, A. (1995). Mapping the binding-site crevice of the dopamine D2 receptor by the substituted-cysteine accessibility method. Neuron 14, 825-831. 24. Javitch, J. A., Fu, D., and Chen, J. (1995). Residues in the fifth membrane-spanning segment of the dopamine D2 receptor exposed in the binding-site crevice. Biochemistry 34, 16433-16439. 25. Javitch, J. A., Ballesteros, J. A., Weinstein, H., and Chen, J. (1998). A cluster of aromatic residues in the sixth membrane-spanning segment of the dopamine D2 receptor is accessible in the binding-site crevice. Biochemistry 37, 998-1006. 26. Fu, D., Ballesteros, J. A., Weinstein, H., Chen, J., and Javitch, J. A. (1996). Residues in the seventh membrane-spanning segment of the dopamine D2 receptor accessible in the binding-site crevice. Biochemistry 35, 11278-11285. 27. Lu, Z. L. and Hulme, E. C. (1999). The functional topography of transmembrane domain 3 of the M1 muscarinic acetylcholine receptor, revealed by scanning mutagenesis. J. Biol. Chem. 274, 7309-7315. 28. Ligneau, X., Morisset, S., Tardivel-Lacombe, J., Gbahou, F., Ganellin, C. R. et al. (2000). Distinct pharmacology of rat and human histamine H(3) receptors: role of two amino acids in the third transmembrane domain. Br. J. Pharmacol. 131, 1247-1250. 29. Green, S. A., Cole, G., Jacinto, M., Innis, M., and Liggett, S. B. (1993). A polymorphism of the human beta 2-adrenergic receptor within the fourth transmembrane domain alters ligand binding and functional properties of the receptor. J. Biol. Chem. 268, 23116-23121. 30. Wieland, K., Laak, A. M., Smit, M. J., Kuhne, R., Timmerman, H., and Leurs, R. (1999). Mutational analysis of the antagonist-binding site of the histamine H(1) receptor. J. Biol. Chem. 274, 29994-30000.